Compact, robust and corrosion resistant Salter suspended retail scales. The 150mm diameter dial is housed in a tough ABS plastic case with a shatterproof polycarbonate dial cover. Low friction acetal bearings provide positive movement to give maximum sensitivity. 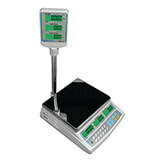 These suspended retail scales are accurate to one part in 250 with up to 15% zero adjustment. Supplied with top and bottom hook for a choice of weighing solutions.